This textile (second from the left in the photograph) is from the archive of Zika Ascher, a textile manufacturer who based himself in London after the annexation of his home country of Czechoslovakia in 1939. It was made in four colourways: navy and white, mustard yellow and white, pale blue and white, petunia and white. Ascher was an innovative designer whose company became incorporated in 1942 (Ascher Ltd). His wife designed for him, and he also employed artists freelance. 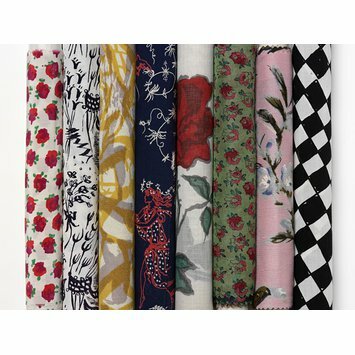 This textile design was made by the society photographer and set designer Cecil Beaton. This particular design is typical of those made into smart summer dresses in the late 1940s. The French couturier Balmain chose it for an afternoon dress for his Summer 1946 collection, and it appeared in the French fashion magazine Jardin des Modes in that same season, accessorised with a dark wide-brimmed straw hat, and dark gloves. The dress had wide shoulders, and the skirt was gently pleated with a soft bow. Loom width dress fabric of two colourways of white organdie printed with large, painterly rose stems. The roses and their stems are outlined and the colour applied in a bold manner with sweeping brush strokes. Petunia-coloured roses with green stems, outlined in dark blue. A photograph of a model by Pierre Cardin in this fabric appeared in Jardin des Modes in the summer issue of 1946. 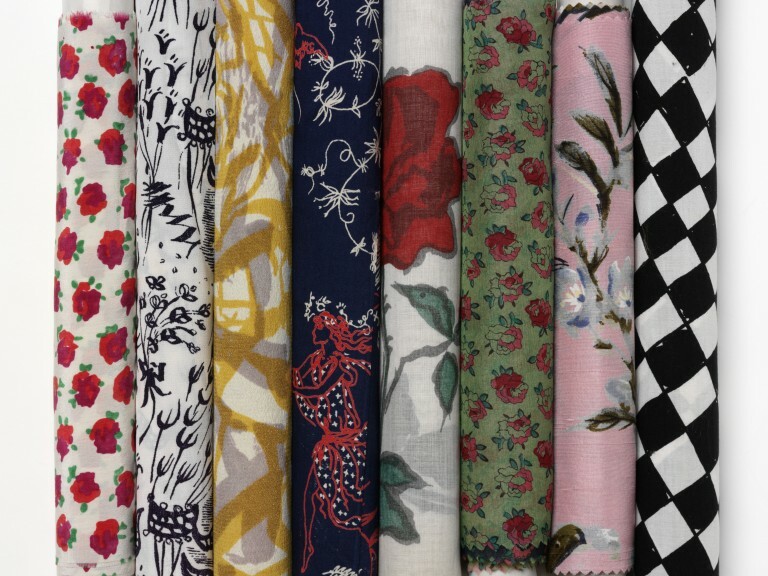 Attribution note: Ascher made textiles which were initially sold to haute couture, and then more widely.